No excuses are necessary to make a celebration out of Friday afternoon, especially when it means extending the Independence Day celebrations over what will surely be one of the most hopping weekends of the summer. 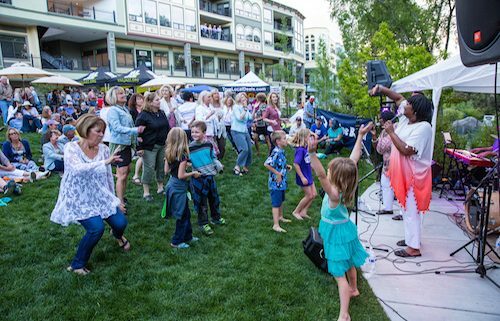 In the spirit of weekend celebrations, the 2018 Vail Jazz @ Riverwalk series is expanding to every Friday this summer, kicking off July 6 with statewide soul sweetheart Hazel Miller, wrapping up Aug. 24 with organ-rich funk trio Claxton, Kovalcheck and Amend and packed with a broad gamut of energetic, eclectic artists in between. If you missed Miller at Blues, Brews and BBQ, here’s your big chance to see her up close in all of her glory. Vail Jazz caught up with Hazel Miller for a little insight on her proclivity for getting the good times rollin’. Vail Jazz: How did you learn that singing was your calling in life? Hazel Miller: I think it hit me around 8. I wanted to sing. My family watched Ed Sullivan EVERY Sunday night. Seeing Ella Fitzgerald, Patsy Cline, Lannie Kazan, Sarah Vaughn and so many more gave my imagination all it needed to dream. I know that singing fed my heart. Singing also set me apart from my six brothers and sisters. That’s always a good thing for one in so many. It was a thrill when someone remembered my name. VJ: Who are your vocal inspirations? HM: I like big voices. I love singers that take risks. I love singers that can reach you with their emotion. Aretha Franklin, Sara Vaughn, Ella Fitzgerald, Barbra Streisand, Bonnie Raitt and many more have helped me find my voice. I admit that I’ve borrowed style, expression and content from several singers, female and male. Nat King Cole, Steve Linwood, Stevie Wonder, Billy Eckstine … these are just a few of the singers that have sent my head spinning with new ideas. VJ: What is your absolute favorite number to perform and what makes it special? HM: I don’t have an absolute favorite. Each performance is different and each audience is different. A favorite song is the song that moves my audience that night. VJ: How do you go about selecting the songs you’ll perform? HM: I will prepare a set list and proceed to change it on stage to accommodate where the audience is at that time. This habit has become a great inside joke in the band. We will make the changes instantly to fit the mood of the audience. We get very excited when we can keep the energy rising and the audience dancing. We offer excitement … a release for a little while. It’s a real charge for all of us to be able to reach out and touch the audience. VJ: How do you know which selections will light up certain audiences? HM: No one knows the answer to this question. You can only anticipate so much. You have a game plan of what to play then you fine-tune it as the performance continues. VJ: You have a unique ability to get people on their feet and hypnotized by your energy. Your voice has been described as a ‘force of nature.’ What do you love most about performing? HM: The smiling faces, the little kids dancing with their families and friends. Singing is like flying. This is the best band I’ve ever had the pleasure to work with. We all support the others’ flight of fancy when we perform. It’s a group effort to find the right groove and right expression for each song. VJ: Of all the memorable feedback you’ve received over the years, has there been a standout comment from a fan or audience member? HM: Audience members offer the nicest compliments. It’s always appreciated and absorbed into my memory. Once my granddaughter told me I was her Aretha Franklin. I think that one warms me the most. It is humbling and exciting at the same time. When the band compliments me after a show it is special because it means that I went to a special place that I don’t always reach every night. Don’t miss Hazel Miller’s free outdoor performance on July 6 for Vail Jazz @ Riverwalk in Edwards. Music kicks off at 6 p.m. and food/drink vendors open at 5 p.m. Picnics are welcome at Vail Jazz @ The Riverwalk, but no pets are allowed and the event is non-smoking. For more information, call 970-479-6146.